Starts July 11th - Ends August 22nd / Automate your life. Program a robot to obey your every command. This project was created on 04/14/2016 and last updated 3 years ago. 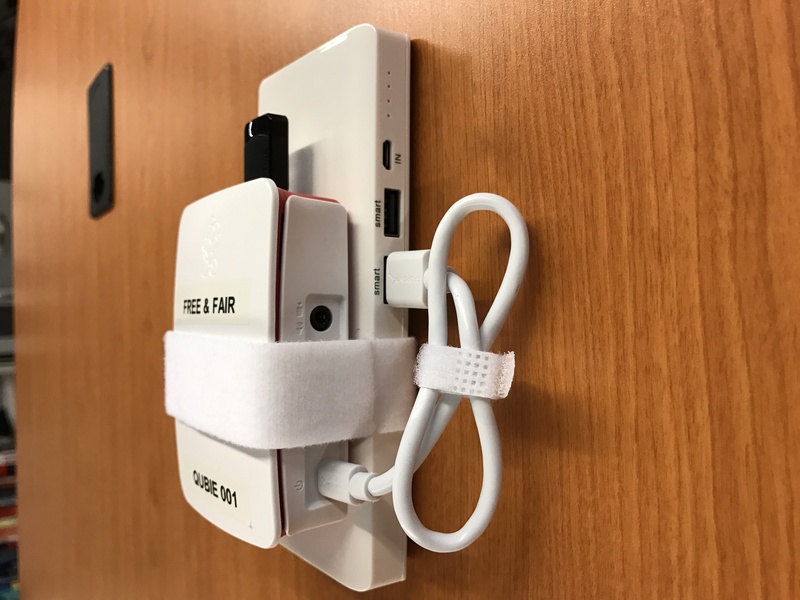 Qubie uses public wireless signals from smartphones and wearables to measure how long voters wait in line at a polling place. Throughout the day, Qubie can build a detailed picture of waiting time, delays, and smooth stretches by time of day. The data Qubie produces is 100% anonymous and can help election officials better understand the needs of polling places by providing straightforward queue data. The data can then be used in conjunction with other information to better allocate resources and poll workers, in order to ensure election days go smoothly. Qubie goes one step further, and makes waiting time data available to voters through mobile and web apps. Voters can check what the wait times currently are at their respective polling place, and can time their visits accordingly. Qubie is built on open hardware and its software is open source. It is available for jurisdictions to implement themselves at no cost. Jurisdictions should develop models and tools to assist them in effectively allocating resources across polling places. Election officials should keep track of wait times at individual polling places using simple management techniques, such as recording line length at regular intervals during Election Day and giving time-stamped cards to voters during the day to monitor turnout flow. Qubie is our proposed solution to this problem. the ability to help election officials automatically publish the current wait time at all polling places on Election Day. Qubie is distributed under a 3-clause BSD license, and is available on GitHub at https://github.com/FreeAndFair/Qubie. A photo of Qubie from the front. A photo of Qubie from the back. A photo of Qubie from the side with connectors. A photo of the major components of Qubie. A photo of all parts of Qubie, including the individual case pieces. 1 × Raspberry Pi 3 Other Raspberry Pi hardware should work as well, but will not support Bluetooth Low Energy out-of-the-box. 1 × Micro SD Card The card needs to be large enough to install Raspbian, and still have space for 100MB or so of data files. To be safe, a minimum of 8 GB is recommended. 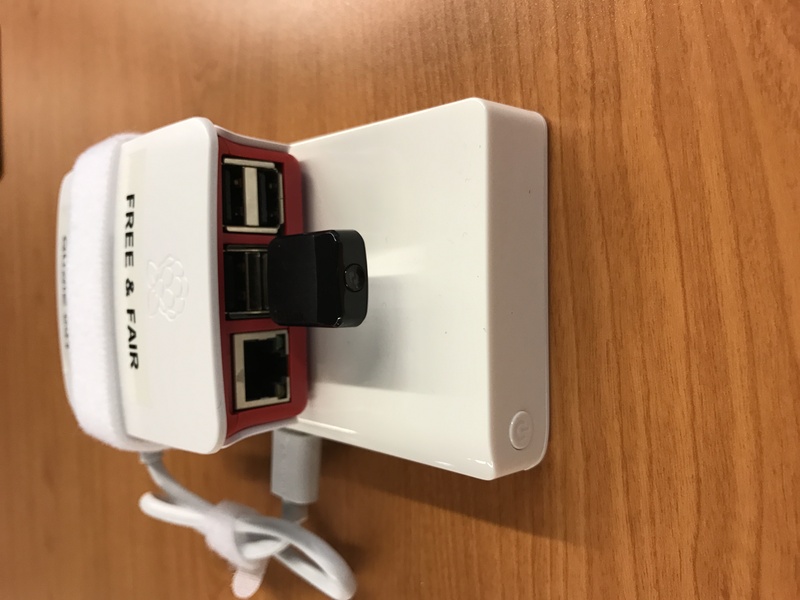 1 × D-Link DWA-171 For WiFi monitoring; can be substituted with any other WiFi adapter for which the Raspberry Pi drivers support monitor mode. Watch both Hackaday and the page above for future updates on both Qubie development and deployment. We&apos;re also really excited about some upcoming media coverage and can&apos;t wait to share it with you all! As part of the Hackaday Prize competition, we had to produce a short video about Qubie... and it&apos;s now live, here. Enjoy! In doing more evaluation on Qubie Zero, we ran across some issues with the documentation that would have potentially prevented a successful build; so we&apos;ve fixed those in the repository, and the instructions in INSTALL.md should now work on basically any Raspberry Pi hardware (keeping in mind not to build the Bluetooth stuff on hardware without Bluetooth). We&apos;ve also done some head-to-head power benchmarks using the same 13400mAh battery pack, and found that Qubie runs for about 24 hours, while Qubie Zero runs for about 40. That is, Qubie Zero runs 66% longer on the same battery — which is great for deployment in polling places, as it means we can use much smaller and cheaper batteries (on the order of 5000mAh, at a cost of about $5) to get Qubie Zero through an entire day at a polling place. Of course, these power numbers will change dramatically in future versions of Qubie when we are uploading information in real time for analysis and reporting... but it&apos;s a much better starting point. Initial Tests of "Qubie Zero"
It uses a Raspberry Pi Zero instead of a Raspberry Pi 3. It has no Bluetooth LE status notifications. 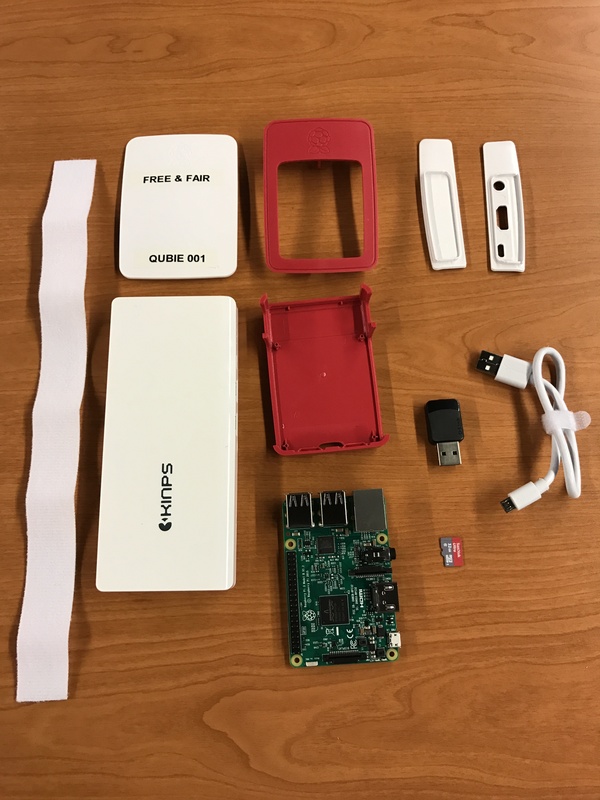 Qubie was featured in a TechCrunch article in mid-August - https://techcrunch.com/2016/08/12/qubie-is-an-open-hardware-solution-for-tracking-wait-times-at-voting-places/ - and was also selected as a Hackaday Prize Finalist in the Automation round! We&apos;ll have a busy September: working on possible deployments for the November election, filming a Hackaday Prize video, and testing Qubie&apos;s software on some cheaper open source hardware to make it more practical for wider adoption. Real-World Deployment: Shasta County, California, 7 June 2016! The first deployment of Qubie in an actual election took place on Tuesday, 7 June 2016, at 10 polling places in Shasta County, California! They were deployed for the entire day, and (anonymously!) logged a total of over 30,000 WiFi contacts. We&apos;re in the process of analyzing the data now, but we&apos;ve already seen from initial data plots some phenomena that we expected to find: surges in polling place activity around lunchtime and near the end of the day. We anticipate that these data sets will help us improve our models, to make Qubie more useful for real-time reporting. Thanks for participating in our pilot deployment, Shasta County! 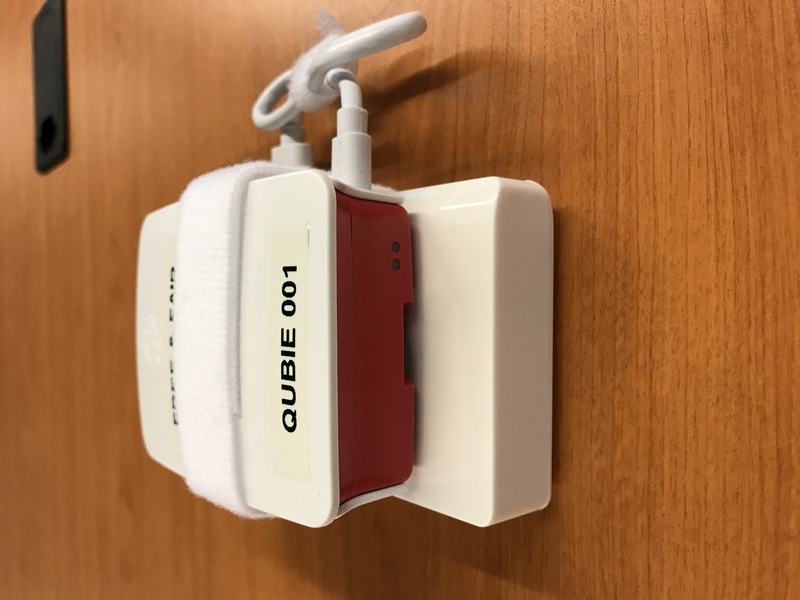 We&apos;ve now tested the Qubie prototype around the office a few times; 3 of them, actually - they all look like the one pictured below, but with a short USB cable connecting the Raspberry Pi to the battery. In addition to gathering a lot of useful presence data for us to analyze, our testing also yielded some very encouraging battery life numbers. 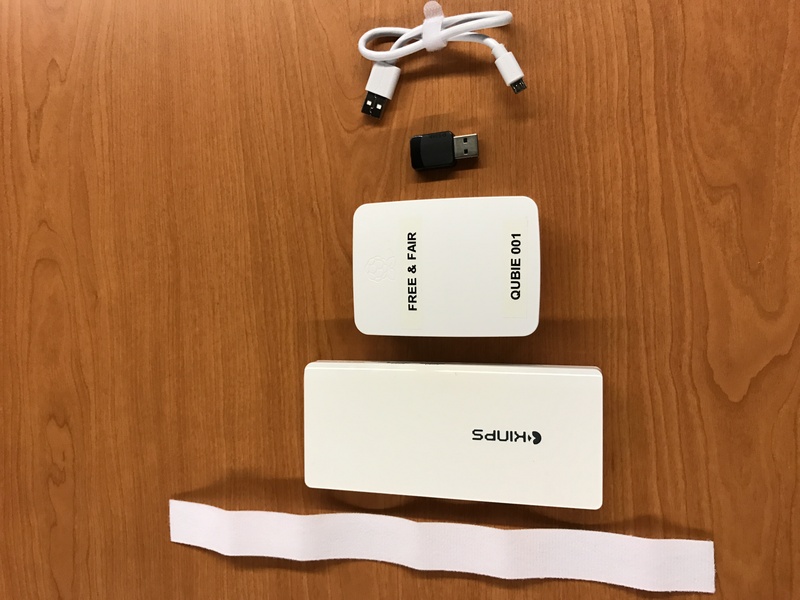 Using the 18500mAh battery shown in the picture below, Qubie can run for about 36 hours while providing an update every minute to a connected Bluetooth LE device. That&apos;s far more time than we&apos;d need at a typical polling place, since polling places are usually open for between 12 and 16 hours. We hope to deploy Qubies in conjunction with elections process researchers during the Presidential Primaries in a few dozen polling places. We are working with a key organization in that space. Stay tuned! We have shared the Qubie concept with our friends on the Presidential Commission on Election Administration (the PCEA, for Election geeks), select members of the Board of Advisors of Verified Voting (on which one of our team members sits), and members of the Elections Verification Network. Feedback has been uniformly positive and enthusiastic thus far. We are excited to put Qubie in the running for HackadayPrice2016! With Qubie, we aim to build an easy to use and straightforward device that automates the measurement and estimation of polling queue wait times for election officials and voters at home. Next level citizen science project: an open & global network of low-cost meteor cameras. Goal: explore the Solar System from your home! A dedicated HAB platform with 2-way communications via www.aerospark.co that can be used to experiment low cost space launch technologies. You are about to report the project "Qubie", please tell us the reason.